Context-sensitive on-line help lets you find the answer to any question quickly, provides guidance for any special diet by including information on 26 nutrients for each ingredient. Cooking Companion uses a new database technology which stores more recipes in less disk space. Popular Windows features like folders and drag-and-drop make entering recipes a breeze. For quicker interaction, It has unique graphical images on every button, Context-sensitive on-line help lets you find the answer to any question quickly. 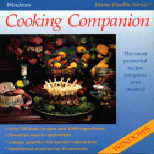 Cooking Companion also provides guidance for any special diet by including information on 26 nutrients for each ingredient. Interactive Cookbook: Contains over 700 tasty recipes and over 1,500 ingredients; Organizes all of your recipes in one place; Lets you add an unlimited number of your favorite ingredients, recipes and cookbooks; Searches for recipes by cookbook, recipe group, recipe name and specific ingredient; Re-calculates the number of servings instantly. Powerful Printing Capabilities: Lets you print cookbooks, recipes, cooking instructions and shopping list; Creates a shopping list which combines like ingredients from various recipes. Nutrition Information for Healthy Cooking: Provides guidance for special diets by using the nutritional breakdown for 26 essential nutrients. Technical Features: Uses Relational Database technology - which stores more recipes in less disk space; Has an open file structure which is easily accessible from other database programs.